In a world were many people is trying to rank high their articles on Search Engines, we can get lost very easily. I’ve been there, testing and trying each one of the hundreds and thousands of programs and internet services promising you that will get your website ranked high on Search Engines, and wasting my money from it. Welcome to my Market Samurai Review, where I’ll cover all the basics and the top reasons to buy this excellent Keyword research tool. Grab yourself your FREE Market Samurai Trial for 7 days and receive a 35% discount! : Click here to get the special offer. How to find your competitor’s backlinks and BEAT THEM! How many backlinks do I need to rank in the first page of Google? Probably out of 10 program available in the internet, only 1, if not less, will help you get ranked where you want. And Market Samurai is one of this tools, but ONLY if you know how to use it. I’ve been using Market Samurai for 1 year already, and I still have some things to learn. Market Samurai does not use Black hat SEO techniques. So, if you’re interested on those (you shouldn’t), you’re on the wrong page. Market Samurai does not create trillions of backlinks. Yes, this is true. 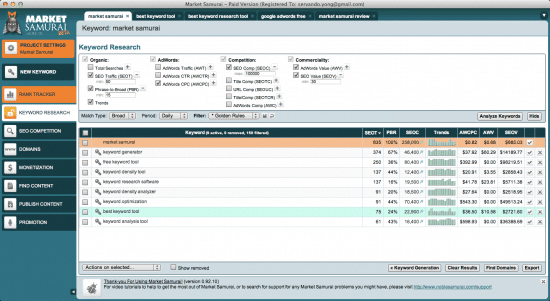 Market Samurai is a Keyword Research and competition analysis tool. Not a backlinks tool. Market Samurai isn’t a magic tool that will help you rank anything you like on google’s first page. OK, now that we’re over that part, let me tell you exactly what Market Samurai can make for you. Market Samurai can help you identify the right keywords to appear on Google’s first page. Yes, I said IDENTIFY. This means you don’t select the keywords. You actually look for them. Market Samurai can let you know more about your competition. You can get to know where are they getting their backlinks, and how many backlinks you need to rank higher than they. Market Samurai can help you identify monetizing options, such as well sold products or articles. Market Samurai can help you organise your content from several blogs from just one window. Market Samurai works both in Windows and OS X (tested by myself). And yes, this can be a big issue as many tools are only Windows based. As I’ve told you at the beginning of this article, I won’t recommend any product if I haven’t tested it first. I really need to be satisfied with the product itself so i can write this post, and of course, with Market Samurai I am. But instead of telling you what you can find and do with Market Samurai (which is being published everywhere, including the Market Samurai Dojo), let me show you some examples on how it has worked for me. This functionality is one of the best ones in Market Samurai. In fact, Market Samurai could only have this feature and I’d still buy it. It’s like the heart of the code, and for a good reason. So, when I was about the read this article, the first thing I did was to research the right keywords for it. From a list of almost 700 keywords related to Market Samurai, I selected the “Market Samurai” keyword as my option considering the competition and the total traffic it can drive to my website if I manage to rank it high. As you can see in the image, I also found many other keywords that passed what Market Samurai calls the “golden rules”, including: Best Keyword Tool, keyword density tool and others. So, why didn’t I chose one of those keywords? Please continue to read and you’ll find the answer. If you already want you Market Samurai license, then click here and enjoy a 7 days FREE trial and a 35% discount: Get Market Samurai here. But let me show an example of how I managed to rank some Keywords on the first page of Google with market Samurai too. In the following case, I used Market Samurai to get into a very difficult niche; the iPhone and iPad tutorials. So what I did was basically search for different keywords around how to charge any of your Apple devices faster, thus including the iPhone, iPad and iPod. Of course I was tempted with the search engine traffic it could mean to be at the top, so after making some analysis I decided none of my blogs was going to be able to achieve it on a short length basis, so I decided to open my Hubpages profile and write it there. Yes, at this moment I’m ranking on the number 3 result for the keywords: charge iPad faster, charge iPod faster and charge iPhone faster, all of them with the same article. Pretty cool huh? I even started to write more Hubs after being ranked that good, and built some backlinks to it. So for conclusion, what you need to know is that while Market Samurai isn’t going to make your articles appear on first page, it will help you decide whether or not the article has potential, and more important, how you compare to your competitors and what do you need to reach them. What happens if I have tens of hundreds of keywords to check every week? That’s fair. I’m pretty sure if you have a blog or several websites you want to check the ranking of different keywords for each of your blogs. That can be a painful task and it could take a whole day. So let me tell you about the last Market Samurai module I’m showing you today. This one is called Rank Tracker. The Rank Tracker Module allows you to keep track of different keywords and different websites. I f you’ve got a license for market Samurai, the Rank tracker allows you to track up to 50 different keywords, which is probably enough if you have 1-3 blogs. You can always update this plan to a higher plan paying some more if you need, but the 50 keywords Market Samurai includes should be enough for most people with 1 License. Before, Market Samurai allowed you to check the ranks of your site for free, but you had to do it everything manually every time you opened Market Samurai. So, for most people having this tool automatised for tracking up to 50 keywords should be more than enough, and you’ll receive a weekly update on your email as a bonus. You can activate up to 50 Keywords with your regular Market Samurai license. What else can I do with market Samurai? Finally, there are more modules to explore, like the monetization and content modules, which allow you to find similar content and the best products to monetize depending on your content, and also a tool to publish content to your blog directly from Market Samurai, however, I think these functions are an extra and can’t be considered for SEO or Page Rank purposes. Market Samurai has more modules depending on your needs, but I’ve explained which ones I use the most. OK, I want to give it a try – where can I buy Market Samurai? The price by itself isn’t bad, especially considering that you’ve got a new tracking tool included for free (up to 50 Keywords) that would cost at least $200. Finally, this isn’t over. Even I’ve covered the basics on this Market Samurai Review, I’ll still write more articles on how to use all the modules, and show you some real tests I’ve done with it with the results (bad and good ones), so don’t miss the opportunity to get Market Samurai and share with me at the comments below. Considering I’ve tested market Samurai myself for 12 months and I managed to achieve great results, I invite you to download Market Samurai and take your free trial. If you have a question on how to do or check something, you can post it on the comments and I’ll get back to you as quickly as possible. Not only you’ll receive some good feedback from me, but I can also show you how to filter the best keywords, how to find long tail keywords and show you to check how many backlinks (and where do they come from) you need to beat the competition. As I’ve said, the key about Market Samurai is to help you find the best keywords to rank, not to rank the ones you already have (even it might be possible after some analysis), and I know how to do that already. So, what are you waiting? You have nothing to lose. You can download your Free Market Samurai Trial and test it. If you don’t like it, don’t buy it. But remember the special 50% discount finishes this Friday 14, so make sure you get it before it ends. UPDATE: The special discount expired. However, you can still get Market Samurai with a 33% discount here: Download Market Samurai. Unluckily the software isn’t as reliable in Spanish as it was before. English and specially tier 1 countries like US, UK, CA are the best for Market Samurai nowadays. Mmmm, I understand. (Hope some developers fill that gap). Funny, I totally forgot about Market Samurai. I’ve been using SEMrush a lot recently but maybe it’s time to check out MS in 2017 again… I always liked it for certain tasks! Yeah, it’s good, although some updates lately haven’t been as good as before. If you’re running sites in USA or tier 1 countries there’s no problem but if it’s a tier3 country the info it throws now is much less than it was before. You’re right. I have been using pro rank tracker for almost 2 years now and i like it more than Market Samurai’s tracker though. I have a website jihad.info and aim of the website is to provide correct info to the people about Jihad. This has been widely misunderstood by Muslims and non Muslims. Would this SW be any good for me and what use can I make of it. Any one can give me any advice, thank you!! Hello James. If you want to know which keywords have more volume and the competition to search high in rankings, yes, Market Samurai will help you do that. Hello , I use Market Samurai for some time and I must say it helps me a lot in the search for my keywords . This is a very good easy to handle software. Yeah, it’s still a really good keyword tool for research. A great review. l have tried the free version of Market Samurai and it has got a lot of features that l liked including the monitization analysis. Before l go Pro, my question is ‘Does it have the button which when you click, it analyses all data and come up with a single figure for each keyword? The figure will tell me if the keyword meets the four attributes and whether it is in the recommended range or not. Surely following each step and analysind all the data is cumbersome. Longtail Pro has got such a button and you only need to check if the keyword is within the recomended range which makes life easy. No, Market Samurai will show you the attributes in separate rankings instead of an overall score as you can see on LongTail Pro. I prefer it this way, honestly, but that’s up to you (especially if you’re beginning with SEO). I prefer market Samurai over Keyword planner, Google uses it only to get advantage for Adwords. Great review Servando, well explained and very informative. I’m using the trial version, and plan to upgrade soon. I really liked how you have explained what market samurai does and what is doesn’t do, it’s pretty hard to find people on the Internet that give honest reviews. I can see why you have good rankings. Thanks Craig. Even though the review is good, I think I provide great value on the added articles at the beginning of this post. You certainly have got quality information in you articles up the top, very handy hints. I wasn’t aware that Google changed their view on backlinks. Was that in the recent algorithm? I thought backlinks weren’t that important anyway, as long as your providing quality content for your readers. Hi Servando, I just found your site. Market Samurai must be doing something right for you. You are on page 1 for the keyword ‘market samurai’ as well as ‘market samurai review’. Action(or in this case, results) always speaks louder than words. Great post. Thanks for all of the information. But yeah, I get what you mean. If someone promises you top 1 rankings but is nowhere to be found in the first pages, it can be somehow disappointing. I feel the same way every time I see a nutriologist or a doctor who is fat and unhealthy. I am on a trial version with Market Samurai, and to date I am extremely impressed. I typically used Google Adwords, but it does not compare to Market Samurai in functionality. I have one concern though – I ran a long tailed keyword in Adwords and the results showed it as High Competition. The result in Market Samurai and SEO analysis showed the top ten results; 9 of the 10 had a page rank of 0, 8 of the 10 had 0 backlinks. 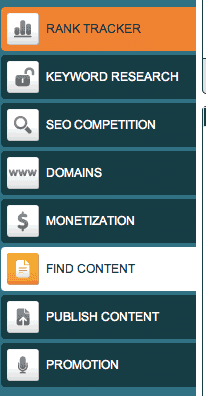 The SEO Competition screen was 90% green – (Low Competition) SEOTCR was 0%, etc…. So, who is correct? Or am I missing something? Market Samurai offers a lot more than the Adwords Keyword planner tool. You need to remember Adwords is for Advertisers and not publishers. Low competition = low volume for ads and cheap ads, High Competition = Many Ads and higher CPC (This is what you want for your website, but not if you’re an advertiser in Adwords). Honestly, unless you’re going 100% for Adsense monetization, you shouldn’t check the Adwords competition anymore. Just follow Market Samurai! Thanks so much Servando – somehow I knew you would clear this up. Interesting, you went from 3rd place to 1st place (on Google) in 2 days on searching “Market Samurai Review”. Love your SEO/Marketing Guide. A lot to take in but well worth it. I’m glad you’re liking the guide! Market Samari is not good at all. First, you have to have adobe air installed to use it. Air entails too much internet security risk. Second, I still gave the trial a shot, and the first time I tried to use it, it came back with a ‘trial expired’ error. I had just installed it. Actually, having Adobe Air isn’t something bad. Thanks to it, many programs can work well with Windows and OS X instead of just with 1 OS. I have been using it for 3 years and there’s no security risk I have lived until now. Can you tell us some examples? Because aside from Market Samurai I don’t use Air for anything else. About the trial error, you can try installing it again. it’s the first time I hear something like that. my blog is relatively new, and has nothing to do with bashing anything, so I don’t see where you get that idea. My response here was serious. I just found it strange that you had to use air. It is the first keyword tool I have seen that requires air. That’s all. I also found it strange that I was immediately presented with an expiration message on the trial version, the first time I tried to use it, when I had never used, or even installed it before. I will admit that I have never used Market Samuri YET, but I really wanted to give it a try. I have tried many keyword tools before, both free and commercial ones, and none were any more accurate with their keyword data than the others, so you’ll excuse me if I am a little skeptical about paying 147 smackers for a keyword tool, especially for one that doesn’t even seem to work on my OS, despite having installed air. Market Samurai has a great support team, so you could try reaching them or simply download it again with another email and start your trial. I have used in the past many marketing tools that are based on adobe air. For example, Facebook and other scrappers. However, if you’re looking for something not based on Adobe Air, give LongTail Pro an opportunity. I think it’s all browser based. I have powersuite seo. Is that a good SEO Tool? Honestly, I haven’t used it and haven’t heard a lot (or good) of things of it. Market Samurai is a SEO analysis tool, while some other tools are for SEO execution. So they might not be comparable at all. Great review Servando on Market Samurai! It’s indeed the best keyword tool around. For anyone reading this, take Servando’s 33% discount offer and get Market Samurai NOW! I’ve been going through a training program for Amazon and they suggested using Market Samurai to do keyword research, so I searched it and found you on page 1 with this article. I just purchased it so you should have a little cash in your bank this morning! You explained things quite well and I am enjoying the info found on your website. I’ll definitely be back! Thanks for the info you are sharing here, I can see from the comments that a lot of people are learning some good info from your blog. Great Job! P.S. You may want to edit this out since you approve comments…. I left a comment on a different page, and your thank you page has an image in the first couple of paragraphs that is not showing up on my browser. Not sure if it is my browser (chrome) or if your image link is broken, so I thought I’b nice and let you know so you can fix it if the problem is on your side. I’ve had this happen before and someone was kind enough to let me know I had an image link broken, so I thought I would be kind and pass the favor forward. Thanks Greg. Yeah, yesterday was a great day specially because of the Market Samurai discount. I’ll check my thank you for commenting page. It’s been sometime since I last checked it. I don’t even remember having an image there!. Thanks again! Thank you for breaking down this information. I am not tech savvy and trying to learn as much as possible as I am interested in creating a blog that helps people. You seem to be very knowledgeable in this area, do you think it is too hard to get into the game at this point? Is creating a niche site an over saturated market? Is this something anyone can learn to do or should you be tech savvy? I feel like nothing is hard enough if you love to do it. I know hundreds of people creating niche sites and while it might seem to be over saturated, I think there are still a lot of niches to go, and as long as you do something different and special, you’ll eventually get there. You don’t need to be a tech savvy to create it, but it helps. Have your tried Metrics11? It is really interesting alternative, it shows you many interesting properties like age of domains of your competitors, accurate competition of advertisers, number of backlinks for top results and so on. Is metrics 11 a free option? I haven’t heard about it in the internet marketing world. very good review about MS. I’m testing it, and it really seems one of the best KW tools. But I can’t understand why the number of monthly searches of any keyword is different of the one of Google Adwords Keyword Tool. Both searches states they are “Exact”, but the difference is really HUGE! Hello Pietro. Are you talking about the new Keyword Planner? I thought the keyword tool was deprecated now. And to be honest, I usually didn’t trust the Adwords tool lately. I prefer going with Longtail pro or Market Samurai. I appreciate your writing. Keyword research is the key of SEO. For this why selection of a good tool for keyword research is also very very important. There are many tools in the internet for this work. And I’ve already tried most of them. But I’ve found colibritool is the best. You can use colibritool for keyword research and so many other SEO works. Using the function “find more keywords”, Colibritool can suggest similar keywords to the ones you are already monitoring.You can also identify keywords visitors typed in order to find your webpage. You can find them in the “suggested keywords” section on the trends panel (they’re marked as “ traffic received”). i normally use Market Samurai but another one is LongTail Pro. How is colibritool doing against those? Nice review without “plugging” the product too much. I read somewhere else that they are now using Bing rather than Google for a lot of the source data. I am worried about this since the search profiles for Google and Bing are completely different. For a one off payment rather than a monthly pricing plan the price seems ok. Yes, they started using Bing on a pair of factors including SEOT. The reason was Google changed some of their stuff and many SEO services wouldn’t work after that. However, Market Samurai is moving many functions to Majestic SEO. And the good thing about that is that Majestic is a big database and it’s independent to Google or Bing. So, expect many good things coming and expect them fast. Market Samurai receives updates almost every week.